The Kayenne opens up the playing field â€“ quite literally. Oversized lenses with our patented curved lens technology gives you style while providing an undistorted, expanded, 180-degree field of vision. 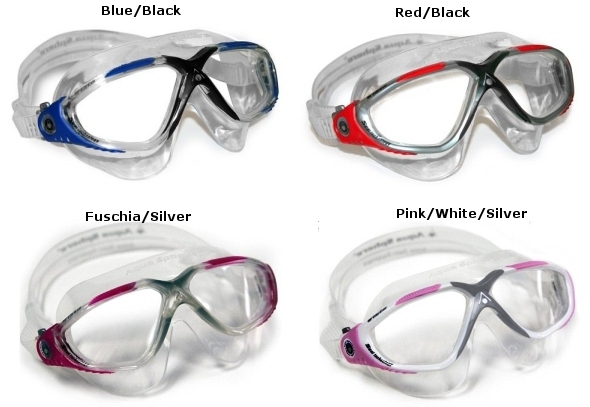 An all new super slim microframe keeps the goggle close to the face for superior, low-drag hydrodynamic performance. And an updated one-touch buckle makes fitting easier than ever. 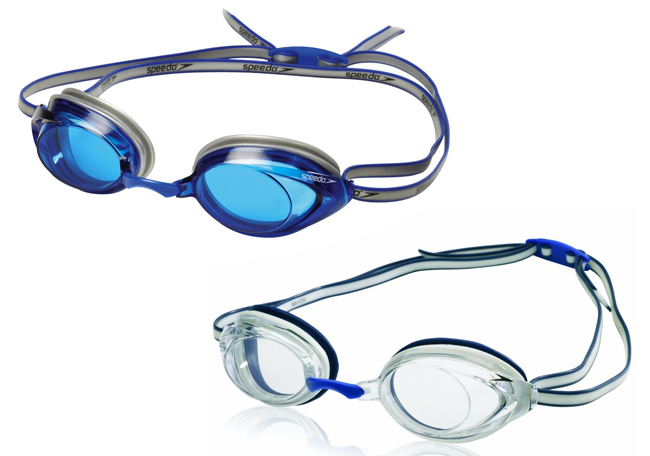 Pair these new technologies with Aqua Sphereâ€™s standard UV protection, leak resistance, anti-fog and scratch resistant lenses, and the Kayenne is easily the most superior performance swim goggle available. The patented curved lens provides 180-degree peripheral vision without distortion. The dive-quality silicone skirt provides a comfortable, watertight fit and easy-adjust buckles let you concentrate on your workout - not on your equipment. The Seal was first recognized for its quality by Ironman triathletes but these unparalleled features are equally beneficial to fitness and recreational swimmers alike. Available in clear or tinted lenses. The Seal XP is a hybrid goggle that combines the superior 180 degree visibility and exceptional comfort of the Seal Mask with the low profile and hydrodynamics of the Kaiman Goggles. It has a flexible, one-piece frame and comfortable, watertight skirt that provides for hours of swimming and water sports enjoyment. The low profile, wrap-around design of the Seal XP creates less drag, has greater hydrodynamics and is ideal for fitness swimming or swim training. The unique PlexisolÂ® lens provides 100% UV protection and is fog and scratch resistant. The innovative easy-adjust buckle system of the Seal XP also allows for quick and easy adjustments, even while wearing the mask. Available in clear or tinted lenses. 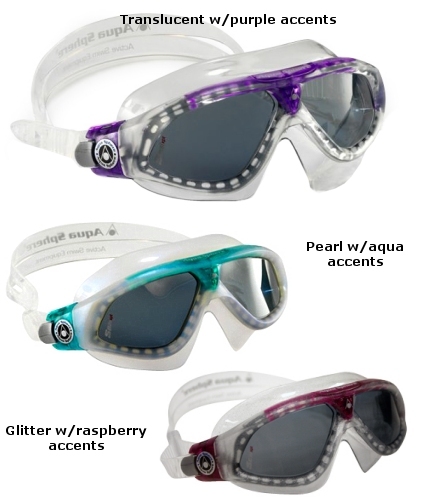 Aqua Sphere's Seal XP is a hybrid goggle that combines the superior visibility and exceptional comfort of a swim mask with the low profile and hydrodynamics of goggles. It has a flexible, one-piece frame and comfortable, watertight skirt that provides for hours of swimming and water sports enjoyment. The low profile, wrap-around design of the Seal XP creates less drag, has greater hydrodynamics and is ideal for fitness swimming or swim training. 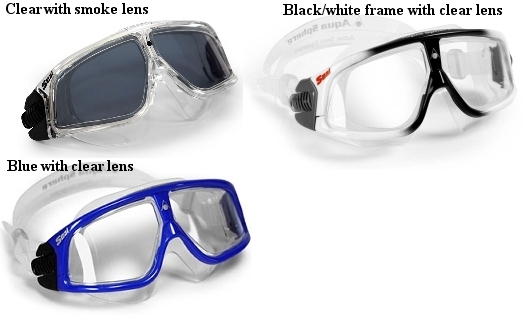 The unique Plexisol lens provides 100% UV protection and is fog and scratch resistant. The innovative easy-adjust buckle system of the Seal XP also allows for quick and easy adjustments - even while wearing the mask. 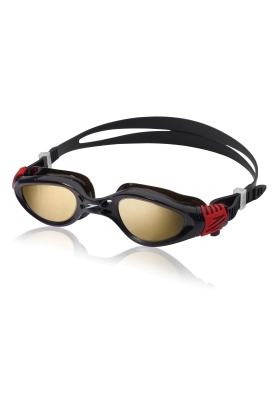 Seal XP swim goggles with tinted lenses are designed to provide the greatest visibility and comfort while swimming outdoors or in bright light. 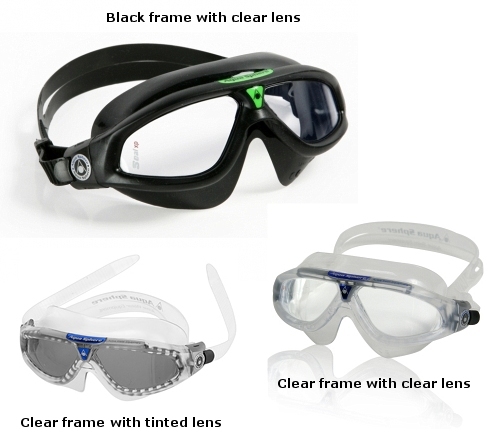 Seal XP goggles with clear lenses are designed to provide the greatest visibility while swimming indoors or in low light situations. 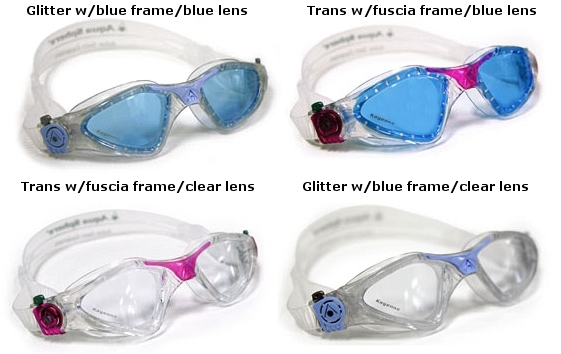 The Vista swim mask features the best in Aqua Sphere aquatic technology. With a comfortable, leak resistant skirt and a contoured, stylized frame, the Vista has an extremely low profile that virtually eliminates the drag experienced with other swimming masks. The crystal clear wrap-around lens of the Vista also provides 180-degree visibility. This, along with the new Quick-Fit one-touch buckle system makes the Vista so comfortable and worry free, you will forget you have it on. 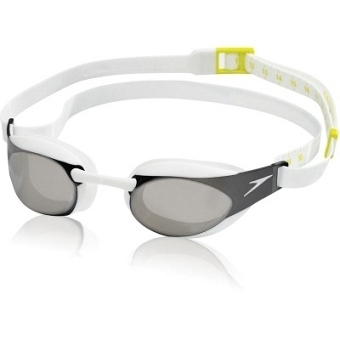 Speedo's Fastkin3 Elite google is the first true 3D goggle seal designed for real head and face contours. Lens: PC smoke, Seal: TPR, Frame: PC, Strap: Silicone. Deluxe plush silicone seal provide maximum comfort. Fully adjustable nosepiece for a custom fit. 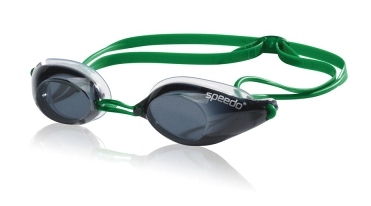 The Speedo Hydrosity is a soft frame goggle with easy adjustable Speed Fit clips. Excellent fitness goggle. Features hypoallergenic comfort seals, silicone split headstrap, and anti-fog and UV protection. PVC and latex free. Available in smoke (shown). 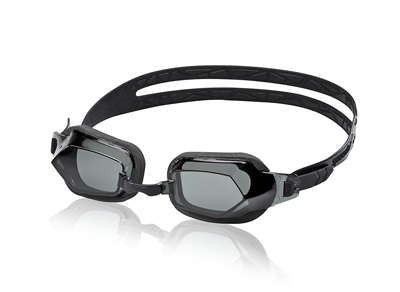 FUNCTION â€“ Fitness: Durable, lap-loving goggles designed for fitness swimmers. FEEL â€“ Soft: Frame cushions your face and maximizes comfort. FIT â€“ Traditional: Classic fit provides great comfort and visibility. FILTER â€“ Clear/Colored: Provides crisp, clear vision indoors and out. FIELD OF VIEW â€“ Standard: Expanded side view lets you keep an eye on the competition. 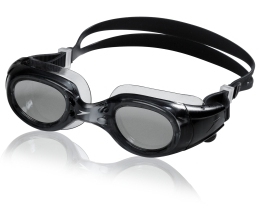 The Speedo Hydrospex 2 goggle is new and improved! Same classic original fit with improved one piece soft flexible TPR frame. Updated styling and materials for increased comfort and durability. Redesigned and integrated Speed Fitâ„¢ clip system provides greater functionality and easy use. 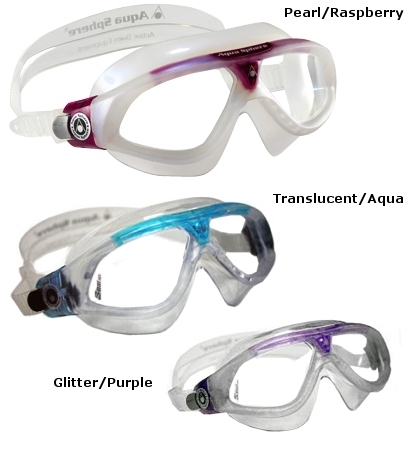 LexanÂ® tough lenses provide optimum safety. 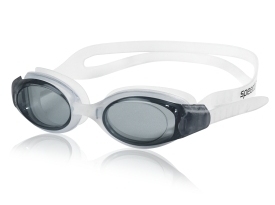 The Speedo Hydrospex 2 features improved comfort, same original fit! Updated styling for increased comfort and durability. Integrated Speed Fit clip system for ease of adjustment. Anti-fog Max and UV Protection. Introducing Speedo's newest goggle featuring a lower profile, and cutting edge liquid silicone technology for unsurpassed comfort. FEEL â€“ Rigid: Hard frame creates watertight seal. FIT â€“ Ultra low: Super-slim profile reduces drag and slices through the water. FILTER â€“ Smoke tinted lens ideal for outdoor use. Wide panoramic lens to maximize peripheral vision. Integrated dual strap system for secure fit. Comes with 3 nosepiece options for custom fit. Designed for open water swimmers. Comfortable seal for extended wear. Great for open water and triathlon swimmers to help better site course markings. Mirrored finish helps reduce brightness and glare. IQ 3D Contoured Seals for ultimate comfort and a secure fit. IQ Fit Technology developed from extensive global head-scanning data. Easy strap adjustment with tensioning scale for accurate fit every time. 3D goggle seal designed to fit the contours of your eye to give maximum leak resistance. Excellent competition goggle! 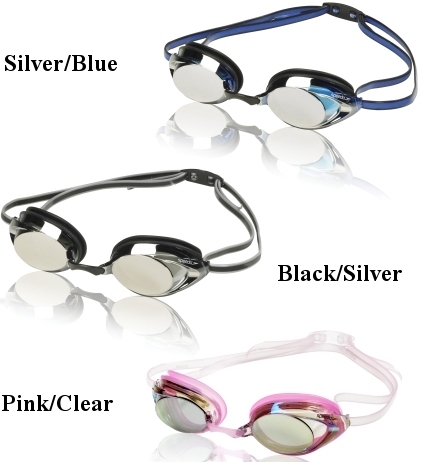 Worn by SpeedoÂ® sponsored athlete Michael Phelps in the 2004 Olympic Games! Low profile design with great peripheral vision. Shatter resistant, polycarbonate lens with UV protection and anti-fog. Hypo-allergenic comfort fit seals and silicone double length headstrap for a more secure fit. High nose bridge with 3 sizes included for a custom fit. 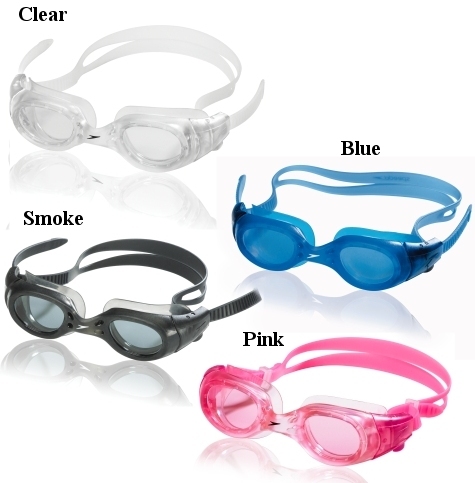 Smoke/black, blue, or clear lenses available. 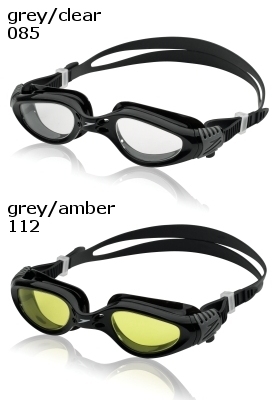 Excellent competition goggle worn by Speedo sponsored athlete Amanda Beard at the 2004 Olympic Games! Shatter resistant, polycarbonate lens with UV protection. Neoprene foam gasket. High performance silicone strap. Available in smoke. 3 improved interchangeable nose pieces. 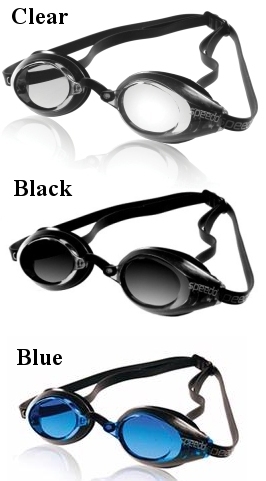 Speedo Vanquisher 2.0 Plus goggles feature updated styling with ultra low profile design and 25% more peripheral vision. 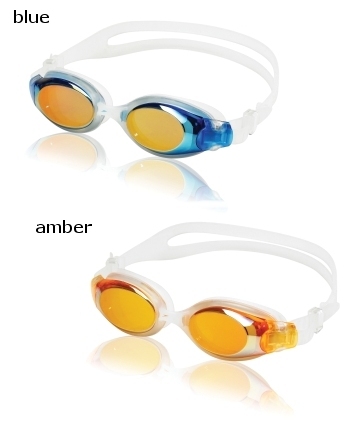 Same classic original fit with soft silicone eye seals. Improved, two color silicone double headstrap and ergonomic adjustable clip. 3 improved interchangeable nose pieces. Ultra mirrored coating further reduces glare. UV protection and Anti-Fog. 100% PVC free. Available in silver/blue, black/silver or pink/clear. 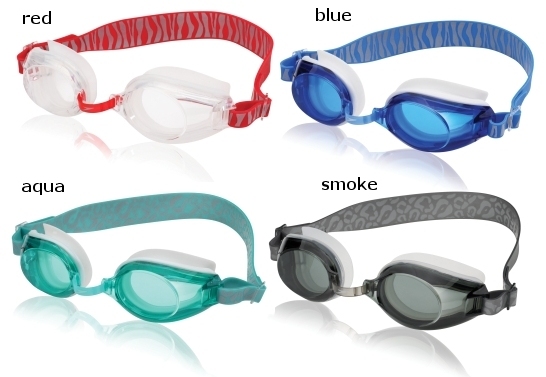 Speedo super-soft seals minimize goggle ring marks. Features Speedo Fit clips . 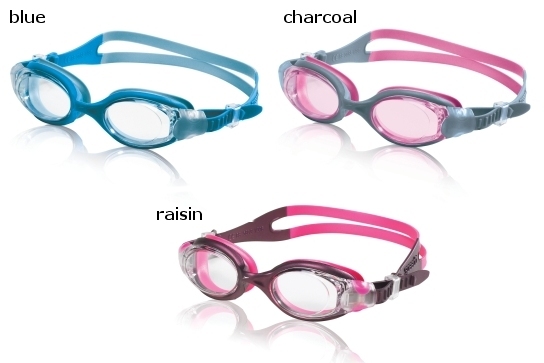 New low profile, pastel colored goggle. Soft silicone lens gaskets and headstrap. Anti-fog, polycarbonate lens with pearlescent mirrored finish, and UV protection 95+. Interchangeable nose piece with 3 different sizes included.